These horsehide headstalls are handmade. We like to use horsehide for its unique appearance, strength and durability. 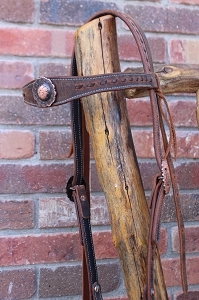 Each headstall is lined with horsehide as well for added durability. When attaching the headstall to your bit, don't forget to add a drop of Locktite to the chicago screw. These classy looking headstalls will provide years of service for your fine bridle horse.